22RF Firing Line Ammo Block: During a BPCR 22 silhouette match only 10 rounds are allowed exposed to the shooter during a relay. This line block not only exposes the proper amount of ammo but provides a fast presentation for easy loading of your rifle. 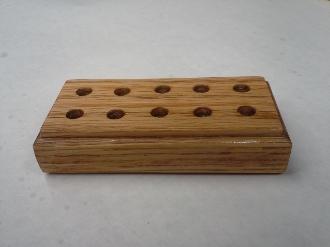 The block is made of quality oak hardwood and is a very handy item for your line box. This is a simple yet very necessary item for the competitive shooter.